Lee Min Ho on T-money cards · K-POPPED! smiling back at you every time you make a payment. T-money card issuers have signed with Korea Smart Card and Etude House’s Lee Min-ho (from Boys Before Flowers fame) to design a special Limited Edition card. What kind of card would that be you might ask? Well, Lee Min-ho’s handsome face on the card, what else! The T-money cards can be used as payment and transportation cards in Korea. T-money card payment service partners with Etude House to celebrate its 1 million production on May 1st. 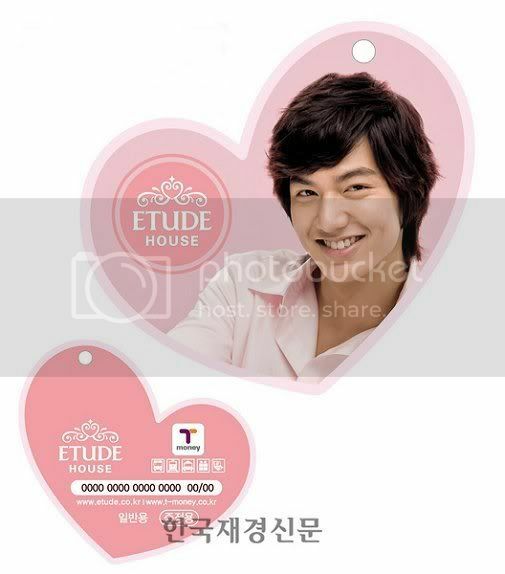 It is hoped that this special limited edition Lee Min-ho Etude House T-money cards will entice women to get the card. It’s a marketing strategy…that i think would certainly work! If i were in Korea, i would definitely want that Min-ho T-money card! GIMME THAT CARD! Where are you watching it Fraulein? You bought the box set? Can I swop my card for one with LMH’s mug? Mine’s a pic of seoul tower. No offense to BBF fangirls, but I think I am getting sick of th F4 obsession already. Th excitement from BBF has long faded for me and I am getting tired of th overhyped products they keep advertising day after day. OMOOOO~etude house! ?there’s one here in penang!but but but the money card only can be used in korea huh?